A while back I wrote about what I did with my food waste that I generated at work. For those that don't know, I have been diligently packing it up in my reusable containers and taking it home with me to compost at home. We do have a bin for a worm composting system, but you have to cut things up in such tiny pieces before putting it in there, that I usually don't have time to stand in the lunchroom chopping up my apple cores and banana peels with the incredibly dull knives we have in there. I figured I'd get some on-the-job injury after slicing off a few fingers and then how would I be able to blog? I mean, really. Well, hoot-de-hoo! Starting Monday we's a' gonna have food waste compost pick-up at work. Are you jealous! Huh, are you? Well, you should be. Our property management is working with Tully's and Cedar Grove Organics Recycling to get the program under way. A compost container will be placed in each kitchen along with information outlining which items are acceptable for composting. Materials collected for composting will be composted in King County instead of being sent by rail to a landfill in Oregon. The finished compost holds water and air in the soil which improves soil health and reduces the need for watering. Composting reduces the amount of material sent to a landfill and the finished compost filters rainwater and controls erosion which results in healthier salmon streams. 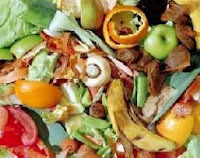 Apparently, "composting 16.8 tons of food waste and soiled kitchen paper rather than sending it to a landfill avoids 7 metric tons of greenhouse gases per year." Well, I can't complain about that! This is going to be soooo much more convenient than dragging my food scraps home with me. One last thing. The picture I have on this post that I found online under "food waste" shows a heap of food that is still edible. Or, at the very least, can be used to make vegetable stock or something else. Yeesh. If you throw out your food waste, would you consider taking it home to compost or otherwise "recycle"? You LUcky Chicky YOU! Boeing is getting serious about their carbon footprint too! The otherday my boss comes into our office with three boxes and gives one to each of us... in the box... A Kleen Canteen! or make that A KUHLeen Canteen. NOt to look a gift horse in the mouth it was very nice, stainless steel BUT look underneath and see the sticker MADE IN CHINA - I knew we were a global company but i didn't know that included making have to be shipped from china SIGG knock off poor choices canteen. LOL Thats why I like the union- there cheap giveaway crap is proudly made in america. Enough of my rant. Tulleys had one of the first compostable cups in the US! ANd if you re-use the lid they give you free pastry! Try it! That is fantastic. I wish NYC would step up its citywide composting. There is only one public collection that I know of...and we have close to 10,000,000 people. I have been trying to get my building to do one but not getting a lot of love. Purloined..I am guessing that the list is NOT for vermicomposting. As far as I have read, that stuff is very upsetting to worm tummies. Hot Diggity Damn, you west coasters get all the fun stuff! I work from home, and all of the food wastes are composted in my backyard composter - with all of the other household wastes. None of your choices really applied in my situation, and I hestitated to selected "None of the above (or I don't work)", because I do work ;). That is so cool. I wish all cities would provide composting containers, just like they do for plastics and glass. For now we are trying, once again, to successfully compost. (Last year's efforts were kind of a flop.) This weekend I'm making a solar digest bin. Big fun! Yes, you are one lucky bird Crunchy. We can't get our landlord at our office to install low flow toilets. Imagine the horror if we requested compost pick up!!!! Our rent would skyrocket! I'm a little puzzled why it's necessary to chop up food waste for your worm bins at work? In years of worm binning I've never bothered with this, the worms get it all in the end. Chopping might make things break down a *little* quicker, but I hardly see that it's worth the bother. The only thing I pre-process for worm binning is eggshells, they do NOT break down on their own and you wind up with big eggshell pieces in the garden. I collect and dry eggshells and then put them through the coffee grinder before going in the bin. You most certainly CAN put meat, dairy, and fat scraps in a worm bin. They will pick the bones clean. The only reason a lot of people don't do it is that a big hunk of meat or similar has the tendency to rot in place before the worms get a chance to break it all down and aerate it, and it can get stinky. And if the worm bin is outside, meat smells could attract animals to break in and wreak havoc. Generally small pieces of meat (like plate scrapings) are OK.
Hey Crunchy! I don't break down scraps for my worms, either. I even have been known to dump in strips of pineapple rind. It all eventually breaks down just fine. We have a compost at work - but not a worm compost - so I selected other! I am very impressed that your office has - the last office I worked in only recycled paper (even though they purchased tons of soda and water bottles that they gave to customers and employees). One day the woman who cleaned confessed to me that they just threw all the paper in the dumpster!! That is SO cool. I wish our work composted food scraps. But considering how many people throw their bottles out when the recycling is RIGHT NEXT to the trash, I'm not sure how many people would get on board. Oh, one more thing. If you keep your scraps in the freezer in a ziplock bag, the freezing process will help to soften and break down the scraps so you don't need to cut them up or do anything with them. The wormies eat the soft mushy rotten stuff as it breaks down, so this does the same thing as chopping. Works good!!! Where is the option for "I'm a little piggie and never have anything left over?" I usually just take leftovers and unless it has bones or an not edible peel, it's gone. Always. Yeah, my workplace (and my city) keep getting greener and greener. The city of Portland (Oregon) in the last year or so has launched a Portland Composts program, starting with restaurants and soon yard waste bins will be able to contain kitchen waste too. (not that I will give the city MY free composty goodness =)) My work not just composts, but uses reusable silverware, compostable food service items ( like cornstarch plastics and compstable paper goods) but also recycles just about everything, plastic film, electronics, Styrofoam. It's inspiring. And I just have to say, Kleen Canteens are not made of aluminum and the interior is not coated in plastic, as are Siggs. I would not use a Sigg. Personally. Hard to beat stainless steel, recyclable easy to clean non toxic. I'm not big on either, since it would necessitate buying a new product, both of which get shipped half way across the world to get here, either way. I just reuse a glass bottle. I would steal the compost items and take them home to my own pile. I'd locate the bags out back and be off with them. The collection people would think the system is just without participants, and if the cops nabbed me, I can imagine the judge's look when they tell him I am in for stealing lunch scraps. Uh-huh. i sure wish we had something like this available here. food waste composting at work would be fantastic. i work in a large (and growing larger by the day) hospital. the amount of food we throw away should be criminal. entire untouched meals because a patient was off the unit for testing (or G-d forbid, to smoke! of course, that's an entire issue in and of itself) then, when s/he comes back to the room, an entirely new meal has to be ordered. rc, I got picked up by campus cops for stealing a square hay bale out of a dumpster. But the thing that killed me was, they picked us up because someone called them. Someone saw us take that bale out of the dumpster and called the cops. The interior of Sigg water bottles are actually coated with a baked-on food safe enamel. hoot-de-hoo? Did you really just say hoot-de-hoo? I can't imagine how the liner could be enamel, enamel is in no way flexible. Sigg refuses to tell what it is made of, so no one really knows anyways. Epoxy resin, plastic, silicone have all also been mentioned. See the Sigg FAQ, it's a flexible proprietary liner, that's about all one can gander. It's still not conducive to good environmentalism to use a product manufactures on the other side of the world, that uses mined materials and a mystery liner with who knows what kinds of compounds from a lab. It's a lifestyle object as is Kleen Canteen actually, extra crap to buy with catchy designs. a fancy consumer product one can get without. I said we have a worm bin, but in reality, I HAVE A WORM BIN HIDDEN IN A DESK DRAWER. I didn't know how people would react if I asked, so I just did it. Since i work at home I can compost-when I did work the thought of requesting a compost bin would have been ovelooked. Your so lucky to have a employer that is stepping up! Yes, glass bottles are the way to go. But when I'm backpacking and/or biking it isn't practical to carry a glass bottle so I bring my klean canteen and sigg bottle. Hi all - I live in an apartment and don't have access to a garden, porch or any outdoor space. I am looking into community gardens. But I would love to start composting - do you have any suggestions? Rosa, sorry to hear that the brown nose people were looking to have you castigated for recycling. When cases get stupid like yours I always look to go before a judge as soon as possible and I try to get some press. However, I have met many enlightened cops from NYC to little ol' Vieques and thus I have managed to skate on pretty much everything and have been to prison only once, and that wasn't for trash retrieval it was for felony embezzlement, a false charge I eventually beat. Yeah, that was prison, not jail. Cops will often figure it out themselves that you are a waste of time for the criminal industrial complex. Cuba is the kind of place where there is a chota always watching and that was what Chavez wanted to do in Venezuela last month. I don't work outside the home much, but if I did I would bring home any food waste that is compostable since we do compost at home. we did have a compost bin but now we have chickens instead! it's amazing the short work a 12x12 cage and a couple of hens can make to the massive amount of food scraps we generate! now i get fresh eggs AND their droppings/decomposed food they don't eat/whatever leaves and such we happen to throw in make wonderful dirt for our garden. It's amazing how wasteful our society is. As an elementary teacher I'm astounded at the amount of government waste that leaves my school each day. Because school lunches are subsidized by government $$ any left over food must be thrown away. We are not allowed to donate it or even give seconds to the children. People should start dumpster diving around public schools...it's amazing what can be found. Except for those dang padlocks on the trash bins. I'm a long distance truck driver ... NO I would not consider saving my food scraps for weeks-on-end in my truck, just to take them home and compost them. Can you imagine the fruit flies and things buzzing around inside my truck? That's where I have to live, sleep, and work 24/7.